This is an invited post written for the Atlas of Living Australia’s blog and shared here with permission. 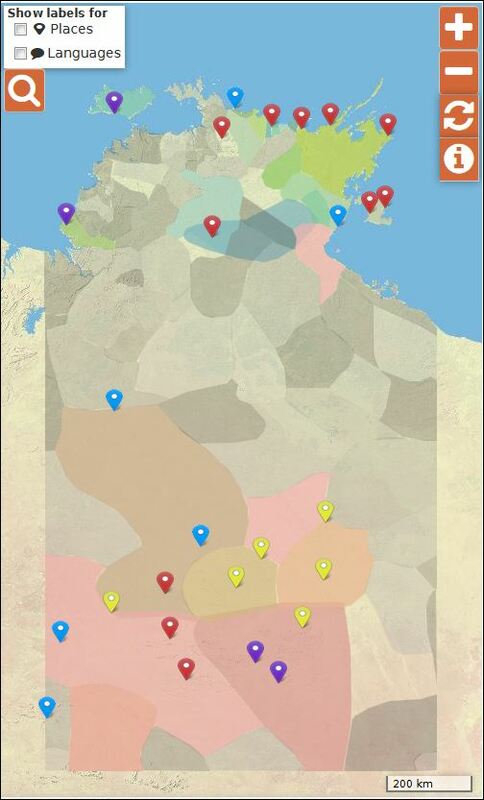 The Living Archive of Aboriginal Languages recently connected with the Atlas of Living Australia, and discussed how we might be able to share some of the information in our collection with the Atlas. 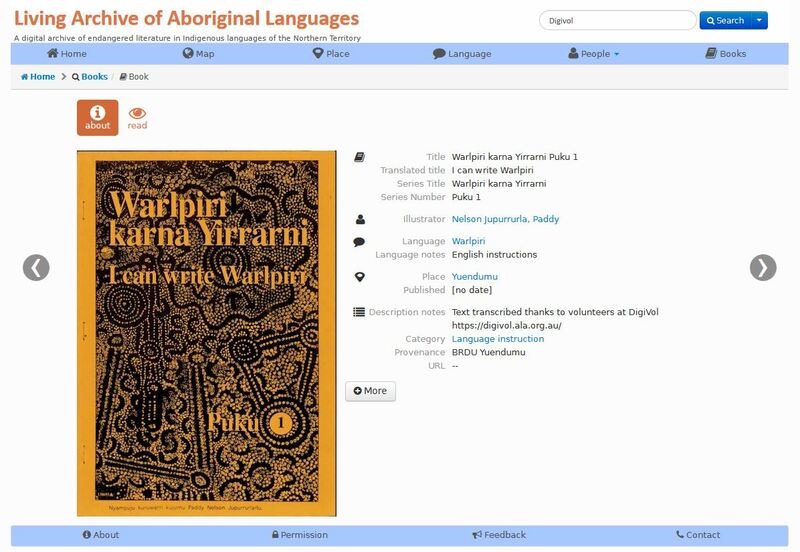 The Living Archive is a digital archive of endangered literature in Indigenous languages of the Northern Territory, available at http://laal.cdu.edu.au. 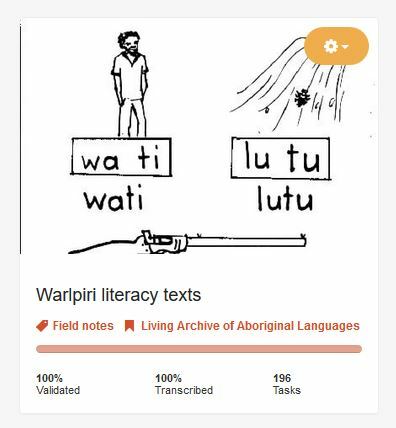 It currently contains over 3500 items in 50 Indigenous languages, all available under a Creative Commons license. All the materials in the Living Archive collection have been digitised and saved as PDFs, and have undergone optical character recognition (OCR) to create a separate text file. This OCR process is often challenging, with the software not always coping well with some materials, such as pages that were handwritten, faded, of poor quality printing, or with text overlapping with images. It also had difficulty handling special characters used in Australian Indigenous languages, such as ŋ, ḏ and ä. In most cases we manually edited the OCRed text, but there were several items that were just too hard. 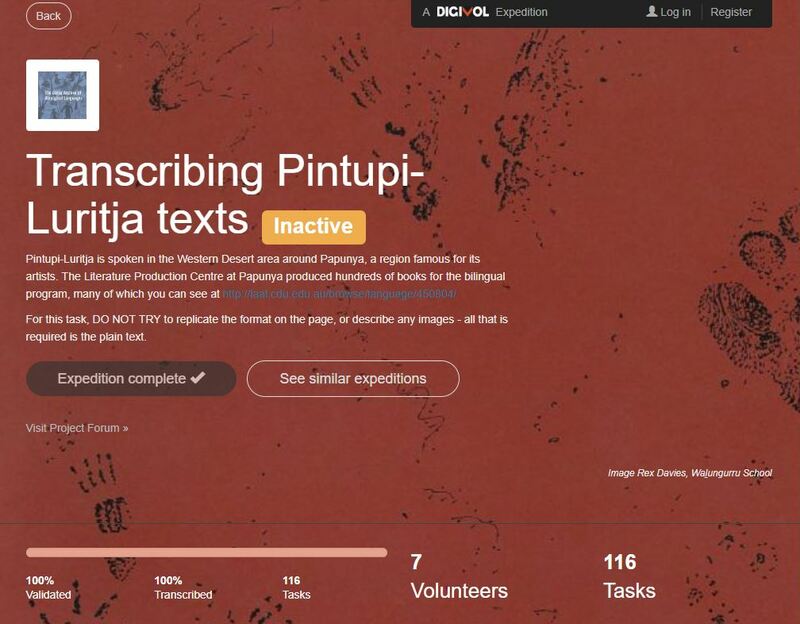 So we were delighted to hear about the Australian Museum’s crowdsourcing website DigiVol. The staff at the Australian Museum have been incredibly helpful at assisting us in setting up our institution and first expeditions, and assuring us that their volunteers would be interested in our materials, despite the texts not being related to natural history. We’ve set up a range of expeditions in a few different Indigenous languages, with materials including scientific information in Yolngu languages, an eyewitness story of a massacre in Gurindji, a book about what animals are good to eat in Pintupi, stories written by children about monsters in Tiwi, and lots of literacy primers used for teaching Indigenous children to read and write in their first language, in Anindilyakwa, Warlpiri and Gurindji. Thanks to the Australian Museum and the Atlas of Living Australia for this wonderful service. The DigiVol volunteers have been a wonderful asset to our project, and we look forward to creating new and interesting expeditions to work on. We’ve also shared with others working on Indigenous languages who are keen to take advantage of such an opportunity, so you might even see more language expeditions coming up. You can register to be a volunteer and engage with stories from the Living Archive or a wide range of other expeditions of natural and local history through DigiVol. This entry was posted in Activities and tagged crowdsourcing, volunteer on November 26, 2018 by Cathy Bow.